For the novel, see Rogue One: A Star Wars Story (novel). Rogue One: A Star Wars Story (or simply Rogue One) is a 2016 American epic space-opera film directed by Gareth Edwards. The screenplay by Chris Weitz and Tony Gilroy is from a story by John Knoll and Gary Whitta. It was produced by Lucasfilm and distributed by Walt Disney Studios Motion Pictures. It is the first installment of the Star Wars anthology series, set just before the events of A New Hope, and follows a group of rebels on a mission to steal the plans for the Death Star, the Galactic Empire's superweapon. The cast includes Felicity Jones, Diego Luna, Ben Mendelsohn, Donnie Yen, Mads Mikkelsen, Alan Tudyk, Riz Ahmed, Jiang Wen, and Forest Whitaker. Based on an idea first pitched by Knoll, ten years before it entered development, the film was made to be different in tone and style from the traditional Star Wars films, omitting the customary opening crawl and transitional screen wipes. Principal photography on the film began at Elstree Studios near London in early August 2015 and wrapped in February 2016. The film then went through extensive reshoots directed by Gilroy in mid-2016. The film premiered in Los Angeles on December 10, 2016, and was released in the United States on December 16. The film received positive reviews from critics, with praise for its acting, action sequences, direction, musical score, visual effects, and darker tone, but received some criticism for its underdeveloped characters and digital recreation of actors from the original trilogy. It grossed over $1 billion worldwide, making it the 29th highest-grossing film of all-time, the second highest-grossing film of 2016, and the third highest-grossing film in the Star Wars franchise. It received two Academy Awards nominations for Best Sound Mixing and Best Visual Effects. Research scientist Galen Erso and his family are in hiding on the planet Lah'mu when Imperial weapons developer Orson Krennic arrives to press him into completing the Death Star, a space station-based superweapon capable of destroying entire planets. Galen's wife, Lyra, is killed in the confrontation while their daughter, Jyn, escapes and is rescued by rebel extremist Saw Gerrera. Thirteen years later, cargo pilot Bodhi Rook defects from the Empire, taking a holographic message recorded by Galen to Gerrera on the desert moon Jedha. After learning about the Death Star from an agent at the trading outpost Ring of Kafrene, Rebel Alliance intelligence officer Cassian Andor frees Jyn from an Imperial labor camp at Wobani before bringing her to the Rebel leader Mon Mothma, who convinces her to find and rescue Galen so the Alliance can learn more about the Death Star. Cassian is covertly ordered to kill Galen rather than extract him. Jyn, Cassian, and reprogrammed Imperial droid K-2SO travel to Jedha, where the Empire is removing kyber crystals from the holy city to power the Death Star while Gerrera and his partisans are engaged in an armed insurgency against them. With the aid of blind spiritual warrior Chirrut Îmwe and his mercenary friend Baze Malbus, Jyn makes contact with Gerrera, who has been holding Rook captive. Gerrera shows her the message, in which Galen reveals he has secretly built a vulnerability into the Death Star and directs them to retrieve the schematics from an Imperial data bank on the planet Scarif. On the Death Star, Krennic orders a low-powered test shot which destroys Jedha's capital. Jyn and her group take Rook and flee the moon, but Gerrera remains to die with the city. Grand Moff Tarkin congratulates Krennic before using Rook's defection and security leak as a pretext to take control of the project. Rook leads the group to Galen's Imperial research facility on the planet Eadu, where Cassian chooses not to kill Galen. Jyn makes her presence known moments before Rebel bombers attack the facility. Galen is wounded and dies in his daughter's arms, before she escapes with her group on board a stolen Imperial cargo shuttle. Krennic is summoned by Darth Vader to answer for the attack on Eadu. Krennic seeks his support for an audience with the Emperor, but Vader instead orders him to ensure no further breaches occur. Jyn proposes a plan to steal the Death Star schematics using the Rebel fleet but fails to gain approval from the Alliance Council, who feel victory against the Empire is now impossible. Frustrated at their inaction, Jyn's group lead a small squad of Rebel volunteers to raid the databank themselves. Arriving at Scarif on the stolen Imperial ship, which Rook dubs "Rogue One", a disguised Jyn and Cassian enter the base with K-2SO while the other Rebels attack the resident Imperial garrison as a diversion. The Rebel fleet learns of the raid from intercepted Imperial communications and deploy in support. K-2SO sacrifices himself so Jyn and Cassian can retrieve the data. Îmwe is killed after activating the master switch to allow communication with the Rebel fleet, and Malbus dies in battle shortly afterwards. Rook is killed by a grenade after informing the Rebel fleet that it must deactivate the shield surrounding the planet to allow the transmission of the schematics. Jyn and Cassian obtain the schematics, but they are ambushed by Krennic, who is eventually shot and wounded by Cassian. Jyn transmits the schematics to the Rebel command ship. The Death Star enters orbit above Scarif, where Tarkin uses another low-power shot to destroy the compromised base, killing Krennic, Cassian, and Jyn. The Rebel fleet prepares to jump to hyperspace, but many of the fleet's ships are intercepted by Vader's flagship. Vader boards the Rebel command ship and attempts to regain the schematics, but a small starship escapes with the plans on board. Aboard the fleeing ship, Princess Leia declares that the schematics will provide hope for the Rebellion. Felicity Jones as Jyn Erso, a young renegade woman who is detained for her crimes against the Empire until she is freed by the Rebel Alliance. She has used many aliases during her life such as Lianna Hallik, Tanith Pontha, and Kestrel Dawn, while her father affectionately calls her "Stardust". Donnie Yen as Chirrut Îmwe, a blind warrior who believes in the Force. He is said to be one of the Guardians of the Whills. Alan Tudyk as K-2SO, a former Imperial enforcer droid who was reprogrammed by Cassian Andor to serve the Rebellion. Riz Ahmed as Bodhi Rook, a former Imperial cargo pilot who defects to the rebels under the influence of Galen Erso. Jiang Wen as Baze Malbus, a longtime companion of Chirrut Îmwe and one-time devoted Guardian of the Whills, now a Rebel warrior and mercenary. Jimmy Smits, Genevieve O'Reilly, and Anthony Daniels reprise their roles from previous films as Bail Organa, Mon Mothma, and C-3PO, respectively. James Earl Jones also reprises his role from previous films as the voice of Darth Vader, who is physically portrayed by Spencer Wilding during the meeting with Krennic and aboard the Star Destroyer, and by Daniel Naprous for the brutal end scene. Grand Moff Tarkin and Princess Leia Organa are played by Guy Henry and Ingvild Deila, respectively, with the digital likenesses of Peter Cushing and Carrie Fisher superimposed. Henry also provides the voice for Tarkin, while archival audio of Fisher is used for Leia. Angus MacInnes and Drewe Henley are featured as Gold Leader Dutch Vander and Red Leader Garven Dreis, respectively, via unused footage from A New Hope; MacInnes returned to record new dialogue for Vander, while new dialogue for the deceased Henley was assembled from archival material. David Ankrum, who voiced Wedge Antilles in A New Hope, reprises his role in a vocal cameo. Ian McElhinney, Michael Smiley, Andy de la Tour and Tim Beckmann play General Jan Dodonna, Dr. Evazan, General Hurst Romodi and Captain Raymus Antilles, respectively. Warwick Davis plays Weeteef Cyubee, a member of Saw Gerrera's Partisans. R2-D2 also makes a cameo appearance. Stephen Stanton, known for his numerous roles in Star Wars: The Clone Wars and Star Wars Rebels, gives voice to Admiral Raddus while Paul Kasey appears in costume as the alien character on-screen. Additionally, Alistair Petrie plays General Davits Draven, Ben Daniels plays General Antoc Merrick, and Valene Kane plays Lyra Erso, Jyn's mother. Jonathan Aris, Fares Fares and Sharon Duncan-Brewster appear as Senators Nower Jebel, Vasp Vaspar, and Tynnra Pamlo, respectively. Simon Farnaby plays a member of Blue Squadron. Jordan Stephens appears as Rebel Alliance member Corporal Tonc. Nick Kellington plays Bistan, the door gunner on a U-wing during the battle on Scarif. Ian Whyte plays Moroff, a member of Saw Gerrera's Partisans. Daniel Mays appears as Tivik. Rian Johnson and Ram Bergman, director and producer of Star Wars: The Last Jedi, respectively, cameo as two Death Star technicians. Richard Franklin plays one of the Death Star engineers. Rogue One is the first film in the Star Wars anthology series, a series of standalone spin-off films in the Star Wars franchise. John Knoll, visual effects supervisor for the Star Wars prequel trilogy, pitched the idea for the film 10 years before its development; after the Disney acquisition he felt as if he had to pitch it again or forever wonder "what might've happened if I had". In May 2014, Disney announced that Gareth Edwards would direct the film and Gary Whitta would write the script. That October, cinematographer Greig Fraser revealed that he would work on the film. In January 2015, it was revealed that Whitta had completed his work on the script, and would no longer be with the project. Simon Kinberg was considered as a replacement. Later in the month, it was announced that Chris Weitz had signed to write the script for the film. In March 2015, the title was announced. Edwards stated that the style of the film would be similar to that of a war film, stating, "It's the reality of war. Good guys are bad. Bad guys are good. It's complicated, layered; a very rich scenario in which to set a movie." Assuming that Disney would not allow a dark ending, Edwards had the main characters surviving in the original version of the script, but the producers opted for a more tragic ending and never filmed the original version. In May 2016, reports emerged that the film would undergo five weeks of reshoots with Tony Gilroy writing additional scenes, as well as acting as a second-unit director under Edwards. With input from Edwards, Gilroy oversaw the edit and additional photography of the film which tackled several issues, including the ending. In August, Gilroy was given screenplay credit alongside Weitz and was paid $5 million for his work on the film. Additionally, Christopher McQuarrie, Scott Z. Burns and Michael Arndt all contributed to the script at various stages in development. In July 2016, discussing whether the film would feature an opening crawl, Kathleen Kennedy said, "we're in the midst of talking about it, but I don't think these [anthology] films will have an opening crawl." Edwards explained that "The idea is this film is supposed to be different than the saga films," and that "This film is born out of a crawl. ... There's this feeling that if we did a crawl, then it'll create another movie." In November 2016, Kennedy confirmed that the film would not feature an opening crawl, instead beginning in "a way that is traditional, with just the title." At the 2016 Star Wars Celebration, Edwards said the title had three meanings: "a military sign", referring to the Red Squadron from A New Hope; "the 'rogue' one" of the franchise, given that it is the first film to not be part of the main saga; and a description of Jyn Erso's personality. In January 2015, The Hollywood Reporter stated that numerous actresses, including Tatiana Maslany, Rooney Mara, and Felicity Jones were being tested for the film's lead. In February 2015, it was announced that Jones was in final talks to star in the film, while Aaron Paul and Édgar Ramírez were being eyed for the male lead role. In March 2015, Jones was officially cast. In March 2015, Deadline Hollywood reported a rumor that Ben Mendelsohn was being considered for a lead role. The next month, TheWrap reported that Sam Claflin was being eyed for a role, while Riz Ahmed was in negotiations to join the film. In May, Mendelsohn, Ahmed, and Diego Luna were added to the cast of the film, in the lead roles. Forest Whitaker was added to the cast in June 2015. In July 2015, Jonathan Aris was cast to play Senator Jebel. Genevieve O'Reilly was cast as Mon Mothma, reprising her role from Star Wars: Episode III – Revenge of the Sith. James Earl Jones was confirmed to return as the voice of Darth Vader in June 2016. Principal photography on the film began at Elstree Studios in Hertfordshire on August 8, 2015. Much of the other photography was completed at or near Pinewood Studios at Buckinghamshire, UK where huge sets were built to complement scenes filmed elsewhere in the world. The film was shot using Ultra Panavision 70 lenses with Arri Alexa 65 large format digital 6K cameras. Filming locations were used around the world. In Iceland, the crew shot in Reynisfjara, and around the mountains of Hjörleifshöfði and Hafursey at Mýrdalssandur, which were used to represent Lah'mu and Eadu. Also used were the Krafla area with its volcanic crater and around Lake Mývatn's rock formations. The islands of Gan and Baresdhoo of the Laamu Atoll in the Maldives, as well as RAF Bovingdon, were used to represent Scarif. Wadi Rum in Jordan was used to represent Jedha. Pymmes Park in Edmonton, London was also used for location filming, and scenes set on Yavin 4 were filmed at RAF Cardington. Gareth Edwards selected the London Underground's Canary Wharf station as a location for a chase scene in an Imperial base; the location shoot took place between midnight and 4 am, when the station was closed to the public. On February 11, 2016, Disney executives stated that the film was "virtually completed". Several weeks of pre-scheduled reshoots began in June 2016. Tony Gilroy, who was an uncredited writer on the film at the time, was hired to direct the reshoots and rework aspects of the film, earning him a screenwriting credit. Industrial Light & Magic (ILM) produced the film's visual effects. ILM used CGI and digitally altered archive footage to insert Peter Cushing's likeness over the body of actor Guy Henry. Lucasfilm secured permission from the late actor's estate to include him in the film. The team reportedly searched through countless hours of Cushing footage in order to find suitable reference material, and Henry provided the motion capture and voice work. A digital model of Cushing was mapped over Henry's performance like a digital body mask. Cushing's mannerisms, including his manner of speaking, were studied by the creative team and applied to the digital Tarkin model. Cushing's family were heavily involved with the creation and had input right down to "small, subtle adjustments". A similar process was used in the portrayal of Princess Leia; Carrie Fisher's appearance as Leia in the first film was superimposed over Norwegian actress Ingvild Deila's face and archival audio of Fisher saying "Hope" was used to voice the character. Post-production wrapped on November 28, 2016. It does borrow from traditions that both John Williams and George Lucas borrowed from when they made the original Star Wars, you know. George was looking at Flash Gordon, the old serials, and John was looking at Gustav Holst and different composers along the way to get a baseline for what he wanted to communicate. There is a wonderful musical language that John put together for the original films. I wanted to honor that vernacular but still do something new with it, something that was still me in a way. —Michael Giacchino on balancing the musical traditions of Star Wars with his original music for Rogue One. In March 2015, it was reported that Alexandre Desplat, who had worked with Edwards on Godzilla, would compose the score for Rogue One. Despite rumors that a contract had not been initially set in place by Lucasfilm, Desplat confirmed in an April 2016 interview that he would serve as composer for the film. Concerning the film, Desplat commented that "[Edwards and I] had a great partnership on Godzilla, and I can't wait to be starting with him. It will be in a few weeks from now, and it is very exciting and frightening at the same time because it's such a legendary project. To be called to come after John Williams ... it's a great challenge for me." However, in September 2016, it was announced that Michael Giacchino would be replacing Desplat as composer, after the film's reshoots altered the post-production schedule, and reportedly left Desplat no longer available. Giacchino only had four and a half weeks to compose the music for the film, beginning almost immediately after finishing production on Doctor Strange. In an interview with Entertainment Weekly in November 2016, Giacchino stated: "It is a film that is in many ways a really great World War II movie, and I loved that about it. But it also has this huge, huge heart at the center of it, and that was the one thing I just didn't want to discount. Yes, it's an action movie, and it's a Star Wars film, and it has all the things that you would come to expect and love about that, but I didn't want to forget that it was also an incredibly emotional movie as well. That was what really pulled me in." Giacchino incorporated John Williams' themes from previous films into the score. The official soundtrack was released by Walt Disney Records on December 16, 2016. All music was composed by Giacchino except where noted. Giacchino, who has a history of using track titles that contain wordplay, shared his alternate list in the liner notes of the soundtrack release. These names are listed in the notes. Rogue One premiered at the Pantages Theatre in Los Angeles on December 10, 2016. The film was released in certain European countries on December 14, 2016, and was released in North America on December 16, with China getting the film on January 6, 2017. Promotion of Rogue One was initially delayed by the release of the film Mission: Impossible – Rogue Nation in July 2015, because the titles are similar. Paramount Pictures registered and cleared the title with the Motion Picture Association of America in January 2015, well before Disney announced the title of its forthcoming Star Wars spinoff. Disney and Lucasfilm had to reach an agreement with Paramount over promotion in order to avoid any confusion in the public mind. Disney agreed to embargo promotion on Rogue One until after mid-2015, with the exception of a very short teaser which was screened at Star Wars Celebration in Anaheim that year. A teaser trailer for Rogue One, released by Lucasfilm on April 7, 2016, was praised by reviewers for its portrayal of strong female characters. The Daily Telegraph described Jyn Erso's character as "a roguish, Han Solo-style heroine", calling the film "progressive", while noting its painstaking faithfulness to the production design style of the original Star Wars trilogy. The Hollywood Reporter also noted the visual nods to the original trilogy, and examined the film's possible narrative direction, considering that the outcome is to some extent already revealed in the opening crawl of A New Hope. The Atlantic writer David Sims stated that the trailer brought "back some memorable pieces of architecture, from the lumbering AT-AT walkers to the Death Star itself, not to mention the glorious 70s costuming of Star Wars." He added that the trailer has "the look", blending the old with the new. The trailer was viewed close to 30 million times in its first 29 hours, at a rate of 800,000 views per hour, from Facebook and YouTube, which is 200,000 views shy of what the first teaser trailer for Star Wars: The Force Awakens was receiving in November 2014. 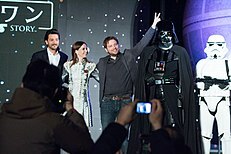 In June 2016, Rogue One was promoted at the Star Wars Celebration Europe III event in London. During the event, a new official poster was unveiled, which depicts a battle taking place on the tropical planet Scarif, with the Death Star looming large in a blue sky, above which is printed the tagline "A Rebellion Built on Hope". A second teaser trailer was also unveiled, screened exclusively for the Celebration audience, and not streamed online. This new trailer was reviewed favorably by critics; The Daily Telegraph noted that the trailer revealed new locations such as the planets Jedha and Scarif, and that its most significant revelation came in the final seconds of the teaser, with the appearance of Darth Vader, reflected in a computer screen and accompanied by his classic breathing sound effect. Variety also hailed the Vader reveal, and noted that the emphasis of the production was much more on the kinetic depiction of large battle sequences and full-on warfare, comparing it to Francis Ford Coppola's 1979 Vietnam War epic Apocalypse Now. A showreel was also shown during the event, which featured footage from the film, cut with behind-the-scenes shots and interviews with the director and cast members. The second trailer was shown publicly during a broadcast of the 2016 Summer Olympics and received favourable media reviews; Wired stated that the trailer was "littered with nostalgic throwbacks to the original trilogy", while Rolling Stone described the CGI landscape shots seen in the footage as "eye-poppingly gorgeous". A further trailer released in October 2016 prompted The Hollywood Reporter to comment that the newly revealed footage looked like "a trailer to a different movie than the one advertised earlier", remarking that Jyn Erso appeared to be portrayed as a more vulnerable character, and highlighting the appearance of Galen Erso as a protective father figure. Vanity Fair also commented on the emphasis given to Jyn's relationship with her father, suggesting that Rogue One was drawing on "the Star Wars franchise's greatest natural resource: daddy issues". The film's publicity tour began in Mexico on November 23, 2016. In Asia, Disney focused marketing efforts on Donnie Yen, where his individual poster is used for marketing in territories including Japan, Singapore, Indonesia, Thailand, Hong Kong, China, Vietnam and Malaysia. The official Star Wars Facebook page of the respective Asian countries also featured clips and videos of Donnie Yen speaking various languages, greeting fans and telling them to support the film. In addition, Disney also released various versions of international trailers with more footage of Yen. 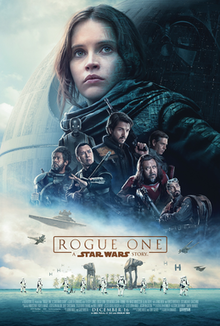 Rogue One was released on Digital HD on March 24, 2017, and by Walt Disney Studios Home Entertainment on Blu-ray, Blu-ray 3D and DVD on April 4, 2017. George Lucas was reported to have enjoyed the film more than The Force Awakens; upon hearing this, Gareth Edwards said "I can die happy now." Rogue One grossed $532.2 million in the United States and Canada and $523.8 million in other countries for a worldwide total of $1.056 billion. On January 21, 2017, the film became Disney's fourth of 2016 to earn $1 billion in ticket sales, joining Captain America: Civil War, Zootopia and Finding Dory. It is the second highest-grossing film of 2016, the third highest-grossing Star Wars film, and the 22nd highest-grossing film of all time, all unadjusted for inflation. It is also the third Star Wars film to gross over $1 billion worldwide, following The Phantom Menace and The Force Awakens. In the United States, it was the top-grossing film of 2016. Deadline Hollywood calculated the net profit of the film to be $319.6 million, when factoring together all expenses and revenues for the film, making it the 3rd most profitable release of 2016. In late November 2016, box office projections for the United States and Canada had the film grossing $100–150 million during its opening weekend. Disney chairman Bob Iger noted that Disney and Lucasfilm did not expect Rogue One to match The Force Awakens' total gross of $2.1 billion, nor its $248 million opening. Pre-sale tickets for the film went on sale at 12:01 AM EST on November 28, 2016. Within 10 minutes, ticket sale sites such as Fandango crashed, much like they had in advance of The Force Awakens the year prior. In its first 24 hours, the film had the second-highest number of pre-sale tickets ever sold, behind only The Force Awakens. Worldwide, the film was expected to gross $280–350 million in its opening weekend. In the United States, the film made $29 million from its Thursday night previews, making it the highest grossing Thursday opening of 2016. On Friday, the film earned $71.1 million, earning the 12th highest grossing opening day of all time. The film grossed $46.3 million on Saturday, securing a total of $155.1 million in its opening weekend, the third biggest debut of 2016. It topped the box office once again in its second weekend, grossing $64 million (down 58.7%) over the three day weekend, and $96.1 million over the four day weekend. On Christmas Day, it grossed $25.9 million. It finished first at the box office again in its third weekend, grossing $49.6 million (-22.5%) over the three day weekend and $65.5 million over the four day weekend, becoming the seventh film of 2016 to top the box office three times, following Deadpool, Zootopia, The Jungle Book, Finding Dory, Suicide Squad, and Moana. In its fourth weekend, Sunday projections had the film grossing $22 million, besting newcomer Hidden Figures' $21.8 million. However, final figures the following day revealed the film tallied a weekend total of $21.9 million, falling to second place behind Hidden Figures' $22.8 million. On review aggregator Rotten Tomatoes, the film holds an approval rating of 83% based on 418 reviews, with an average rating of 7.45/10. The website's critical consensus reads, "Rogue One draws deep on Star Wars mythology while breaking new narrative and aesthetic ground and suggesting a bright blockbuster future for the franchise." On Metacritic, the film has a weighted average score 65 out of 100, based on 51 critics, indicating "generally favorable reviews". Audiences polled by CinemaScore gave the film an average grade of "A" on an A+ to F scale, while PostTrak reported filmgoers gave the film a 91% overall positive score. IGN reviewer Eric Goldman gave the film 9/10, saying, "Rogue One is a movie crammed with fan service, but when fan service is done this well, there's little to complain about and much to adore." Peter Travers of Rolling Stone gave the film 3.5 out of 4 stars, writing, "this spin-off/prequel has the same primitive, lived-in, emotional, loopy, let's-put-on-a-show spirit that made us fall in love with the original trilogy." /Film gave Rogue One 8/10, writing that the film is enjoyable but does not have the emotional weight of The Force Awakens, because "no character in Rogue One was strongly compelling". PopMatters wrote, "Rogue One seems to enjoy spending time on a whole new batch of moons and planets we haven't seen before, reveling in the clutter and clamor of far-flung settlements where anti-Imperial sentiments fester. But the film is bogged down in engineering the complex maneuverings of spy games, dogfights, and the most sprawling Rebel-versus-Empire land battle scene since the opening of The Empire Strikes Back." Justin Chang, writing for the Los Angeles Times, called Rogue One "a swiftly paced, rough-and-ready entertainment." The New York Times wrote, "All the pieces are there, in other words, like Lego figures in a box. The problem is that the filmmakers haven't really bothered to think of anything very interesting to do with them. A couple of 9-year-olds on a screen-free rainy afternoon would come up with better adventures, and probably also better dialogue." Richard Brody of The New Yorker called the film "lobotomized and "depersonalized", and wrote it "isn't so much a movie as a feature-length promotional film for itself; it's a movie that is still waiting to be made." The Washington Post wrote "Rogue One represents an unobjectionable exercise in franchise extension. It's fine. It'll do. For now." IndieWire's David Ehrlich gave the film a C+ rating, calling it "a spirited but agonizingly safe attempt to expand cinema's most holy blockbuster franchise and keep the wheels greased between proper installments ... just a glorified excuse to retcon some sense into one of the silliest things about the original." While he praised the set design and visuals, calling them "gorgeous", he criticized a lack of interesting character development and a script that felt "completely constricted by its purpose." Peter Bradshaw, film critic of The Guardian says "Rogue One doesn't really go rogue at any stage, and it isn't a pop culture event like The Force Awakens, in whose slipstream this appears; part of its charm resides in the eerie, almost dreamlike effect of continually producing familiar elements, reshuffled and reconfigured, a reaching back to the past and hinting at a preordained future. There are some truly spectacular cameos from much-loved personae, involving next-level digital effects—almost creepily exact, so that watching feels at various stages like going into a time machine, back to the 80s and 70s". Rogue One introduced many new characters into the Star Wars mythology, with Chirrut Îmwe, played by Donnie Yen, and K-2SO, played by Alan Tudyk, being the most popular. Yen's performance, in particular, was also applauded by audiences worldwide. In a poll on the official Star Wars website in May 2017, in which more 30,000 people voted, Chirrut Îmwe was voted as the most popular Rogue One character. While much of the computer-generated imagery (CGI) received praise, some news organizations published criticism about certain aspects, including the visual effects (VFX) that were used to revive Peter Cushing, who had died in 1994, as Grand Moff Tarkin. The Guardian's Catherine Shoard described the "resurrection" as a "digital indignity". Joseph Walsh of The Guardian raised legal and ethical issues about bringing a long-dead actor to life. However, Lucasfilm had obtained permission from Peter Cushing's estate before deciding to use his likeness. The Washington Times's Eric Althoff rejected the entire concept of using CGI to recreate a deceased actor: "Alas, what we get is, basically, not a simulation, but an approximation of a simulation—a dead character portrayed by a living actor inhabiting not the character, but imitating the dead actor." Some journalists also criticized the quality of the CGI that was used to represent a younger Carrie Fisher in order to portray Princess Leia at an earlier time, as well as its suitability in movie-making. Eliana Dockterman of Time wrote that "there was something particularly plastic about this version of the young Carrie Fisher—so smooth and so perfect it couldn't be real—that pulled me out of the moment." Kelly Lawler of USA Today said: "... while Tarkin is merely unnerving, the Leia cameo is so jarring as to take the audience completely out of the film at its most emotional moment. Leia's appearance was meant to help the film end on a hopeful note (quite literally, as 'hope' is her line), but instead it ends on a weird and unsettling one." Michael Cavna of The Washington Post described the facial effect as feeling "distractingly artificial and nearly alien, like a plastered death mask robbed of authentic actorly effect, well beyond the usual artifice of Botox." Nonetheless, Fisher was shown the CGI rendition of her younger self for the film by Kathleen Kennedy and "loved it." ^ Each date is linked to the article about the awards held that year, wherever possible. Rogue One utilized Saw Gerrera, a character introduced in the animated television series The Clone Wars, as well as featuring cameo appearances of the Ghost and Chopper from the animated series Star Wars Rebels, and mentioning Hera Syndulla from that series. Characters from the film also appeared in the second half of Rebels, starting with Saw in the hour-long Season 3 episode "Ghosts of Geonosis". The Imperial Death Troopers appeared in the same season's hour-long finale, "Zero Hour". More characters and vehicles that were first introduced in the film appear in the series' fourth and final season, while the film's main antagonist, Orson Krennic, is mentioned by name. On November 8, 2018, it was announced that a live-action prequel series was officially in development and set air on Disney's upcoming streaming service, Disney+. The series will take place before the events in Rogue One and will focus on Cassain Andor with Diego Luna reprising the role. A tie-in novel to the film, Catalyst: A Rogue One Novel, was released on November 15, 2016. Written by veteran Star Wars novelist James Luceno, the story is set some years before the events of Rogue One, and provides a backstory to the 2016 film. The Rogue One: A Star Wars Story novelization of the fim was written by Alexander Freed, and released on December 16, 2016. Months after the film was released, Disney | Lucasfilm Press published another novel titled Star Wars: Rebel Rising on May 2, 2017. Written by Beth Revis, the novel explains what happened to Jyn Erso between the time her mother died and the day when Rebel agents freed her from an Imperial labor camp, a time period that the film skips over in its opening minutes. On the same day Rebel Rising was released, the novel Guardians of the Whills was released as well by Disney | Lucasfilm Press. Written by novelist and comic writer Greg Rucka, it focused on the characters Chirrut and Baze, telling their backstories as well as giving more context to the events that happened on Jedha prior to the film and even the Imperial occupation. Months after the film was released, Marvel Comics adapted the film into a six-part comic book miniseries, which adds extra content. The miniseries' complete collection was released on December 12, 2017. In August 2017, IDW Publishing announced that it would make a one-shot graphic novel adaptation of the film, which was released one day after the Marvel miniseries' collection was released. Unlike the Marvel miniseries, this graphic novel will have slightly more cartoonish visuals. On that same month, Marvel Comics released the Star Wars: Rogue One – Cassian & K-2SO Special, a 40-page one-shot comic focusing on the first meeting between Cassian Andor and K-2SO. The comic was written by Duane Swierczynski and pencilled by Fernando Blanco. A downloadable expansion pack was released for the Star Wars Battlefront reboot, titled Rogue One: Scarif, that allows players the ability to play through the various locations, characters and set pieces from the planet introduced in Rogue One. A free virtual reality mission for PlayStation 4 was also released alongside the expansion. Several characters and concepts from the film were also included in the mobile games Star Wars: Force Arena, Star Wars Commander and Star Wars: Galaxy of Heroes, all available on iOS and Android. ^ a b c "Rogue One: A Star Wars Story (2016)". Box Office Mojo. Internet Movie Database. Retrieved April 15, 2017. ^ a b FilmL.A. (May 23, 2017). "2016 Feature Film Study" (PDF). FilmL.A. Feature Film Study: 22. Retrieved November 22, 2018. ^ a b "Oscar Nominations: Complete List". Variety. January 24, 2017. Retrieved January 24, 2017. ^ "Star Wars Rogue One trailer released". BBC News. BBC. April 7, 2016. Retrieved April 7, 2016. ^ Hildago, Pablo (2016). Star Wars: Rogue One: The Ultimate Visual Guide. Dorling Kindersley. p. 35. ISBN 9780241232422. ^ a b c d e Skrebels, Joe (May 17, 2016). "Star Wars: Rogue One Leak Reveals New Characters, Names, Vehicles". IGN. Retrieved May 17, 2016. ^ a b Saavedra, John (April 7, 2016). "Star Wars: Rogue One - First Trailer Analysis". Den of Geek!. Retrieved April 8, 2016. ^ Khatchatourian, Maane (April 7, 2016). "'Rogue One: A Star Wars Story' First Trailer Arrives". Variety. Retrieved April 7, 2016. ^ a b c d e Lussier, Germain (June 22, 2016). "Meet the Heroes, Villains, and Badass Droid of Rogue One: A Star Wars Story (UPDATED)". io9. Retrieved June 25, 2016. ^ "How Rogue One's Plot Ties Directly into The Force Awakens". TheWrap. December 16, 2016. Retrieved December 20, 2016. ^ "Mads Mikkelsen Playing "Galen" in Star Wars Anthology: Rogue One?". Star Wars News Net. Retrieved April 28, 2016. ^ @SkyNews (April 28, 2016). "Danish actor Mads Mikkelsen reveals that he's playing the father of the main character in Star Wars film Rogue One" (Tweet). Retrieved April 28, 2016 – via Twitter. ^ Wicksell, Dustin (March 11, 2016). "'Rogue One: A Star Wars Story': Alan Tudyk's character revealed? [Spoilers]". Inquisitr. Retrieved April 8, 2016. ^ Ward, Jason (March 9, 2016). "Rogue One: A Star Wars Story's new droid sidekick description & quick sketches". Making Star Wars. Retrieved April 8, 2016. ^ Sprrentino, Mike. "Alan Tudyk on using motion capture for 'Rogue One': Anthony Daniels was envious". CNET. Retrieved August 23, 2016. ^ "Riz Ahmed". Gordon and French. Archived from the original on November 19, 2015. Retrieved January 5, 2016. ^ Porter, Matt (June 22, 2016). "Character Names, Descriptions and New Images Revealed for Rogue One". IGN. Retrieved June 24, 2016. ^ Breznican, Anthony (June 22, 2016). "Rogue One: Forest Whitaker's character has a rich Star Wars history". Entertainment Weekly. Retrieved June 25, 2016. ^ a b Crookes, Del (April 7, 2016). "Rogue One: A Star Wars Story - the new trailer dissected and storylines revealed". BBC Newsbeat. BBC. Retrieved April 7, 2016. ^ a b c d White, Brett (December 16, 2016). "Every Rogue One Cameo You Won't Want To Miss". Comic Book Resources. Retrieved December 16, 2016. ^ Breznican, Anthony (June 23, 2016). "Darth Vader Lives!". Entertainment Weekly. Retrieved August 9, 2016. ^ "Rogue One: Darth Vader storms Rhyl for Star Wars showing". BBC Wales. BBC. December 22, 2016. Retrieved December 22, 2016. While the actor has the body role, just like his predecessor in the original Star Wars films David Prowse, the voice of Lord Vader is actor James Earl Jones. ^ Ward, Jason (April 11, 2016). "Spencer Wilding to play Darth Vader in Rogue One: A Star Wars Story?". Making Star Wars. Retrieved September 1, 2016. ^ a b c Fullerton, Huw (December 16, 2016). "How a Holby City actor brought one of Star Wars' most iconic characters back to life". Radio Times. Retrieved December 16, 2016. ^ a b c Jones, Nate (December 15, 2016). "Let's Talk About the Ending of Rogue One". New York. Retrieved December 16, 2016. ^ a b "'Rogue One' Sound Editors Reveal How They Found Princess Leia's 'Hope' and More Production Secrets". ^ Elderkin, Beth (December 18, 2016). "Here's How Rogue One Got Its Hands on Unseen Star Wars Footage". io9. Retrieved December 18, 2016. ^ a b c Leadbeater, Alex (December 16, 2016). "Star Wars: Rogue One: 15 Cameos You Missed". ScreenRant. Retrieved December 16, 2016. ^ Fullerton, Huw. "Original Star Wars actor reveals how his character was brought back for Rogue One". Radio Times. Retrieved January 7, 2017. ^ Ritman, Alex (July 15, 2016). "'Star Wars' Regular Warwick Davis Returns For 'Rogue One'". The Hollywood Reporter. Retrieved July 15, 2016. ^ Doran, Sarah (December 19, 2016). "Did You Spot All These British and Irish Actors in Rogue One: A Star Wars Story?". Radio Times. Retrieved January 2, 2017. ^ Trumbore, Dave. "'Rogue One' Actor Valene Kane Confirmed as Playing Jyn Erso's Mother". Collider. Retrieved September 26, 2016. ^ "The 2016 Preview - 13 Rogue One: A Star Wars Story". Empire. United Kingdom. February 2016. p. 89. Jonathan Aris will play Senator Jebel. Nope, we have no idea who that is either. ^ Åberg, Erik (October 13, 2016). "Fares Fares gör roll i nya "Star wars"" [Fares Fares makes role in the new "Star Wars"]. Aftonbladet (in Swedish). Retrieved October 16, 2016. ^ Lindholm, Emilie (October 13, 2016). "Fares Fares med i nya Star wars-trailern" [Fares Fares in the new Star Wars trailer]. GP (in Swedish). Retrieved October 16, 2016. ^ "New Rogue One Images and Details from Empire Magazine!". Star Wars News Net. August 28, 2016. Retrieved September 1, 2016. ^ Marc, Christopher (December 5, 2016). "'Prometheus' and 'Game of Thrones' Actor Ian Whyte Plays Moroff In 'Rogue One'". Omega Underground. Retrieved December 18, 2016. ^ Breznican, Anthony (July 17, 2016). "Star Wars Celebration: Updates on Episode VIII and young Han Solo movie". Entertainment Weekly. Retrieved July 18, 2016. ^ Rogue One (Feature film). Credits: Walt Disney Studios Motion Pictures. December 16, 2016. ^ Alexander, Julia. "Rogue One is bucking a Star Wars tradition". Polygon. Retrieved November 23, 2016. ^ "SWCE 2016: 15 THINGS WE LEARNED FROM THE ROGUE ONE: A STAR WARS STORY PANEL". StarWars.com. Retrieved July 22, 2016. ^ McMillan, Graeme (April 20, 2015). "What Happens When 'Star Wars' Is Just a War Film?". The Hollywood Reporter. Retrieved April 8, 2016. ^ Kit, Borys (May 22, 2014). "'Star Wars' Spinoff Hires 'Godzilla' Director Gareth Edwards (Exclusive)". The Hollywood Reporter. Retrieved May 22, 2014. ^ Tapley, Kristopher (October 24, 2014). "Cinematographer Greig Fraser talks 'Foxcatcher,' 'Gambler' and NOT 'Star Wars'". HitFix. Retrieved October 26, 2014. ^ Kit, Borys (January 9, 2015). "'Star Wars' Standalone Movie Loses Writer Gary Whitta". The Hollywood Reporter. Retrieved January 11, 2015. ^ Lussier, Germain (January 12, 2015). "Rumor: Simon Kinberg Will Take Over Writing First 'Star Wars' Standalone Film". /Film. ^ Kit, Borys; Siegemund-Broka, Austin (January 26, 2015). "'Star Wars' Stand-alone Movie Hiring Oscar-Nominated Writer". The Hollywood Reporter. Retrieved January 27, 2015. ^ a b "ROGUE ONE IS THE FIRST STAR WARS STAND-ALONE FILM, RIAN JOHNSON TO WRITE AND DIRECT STAR WARS: EPISODE VIII". StarWars.com. March 12, 2015. Retrieved March 15, 2015. ^ Breznican, Anthony (April 19, 2015). "Star Wars: Rogue One and mystery stand-alone movie take center stage". Entertainment Weekly. Retrieved April 19, 2015. ^ Bishop, Bryan (April 19, 2015). "Star Wars: Rogue One will be about the Rebel Alliance stealing plans for the Death Star". The Verge. Retrieved April 19, 2015. ^ a b Liptak, Andrew (January 15, 2017). "Rogue One's reshoots show how Disney saved the first standalone Star Wars movie". The Verge. Retrieved January 18, 2017. ^ McCormick, Rich (December 20, 2016). "Rogue One director says its original ending was very different". The Verge. Retrieved December 31, 2016. Rogue One's original ending was one such cutting-room casualty. ^ Tassi, Paul (December 21, 2016). "Rogue One's Original Ending May Explain Where All Those Deleted Trailer Scenes Went". Forbes. Retrieved December 31, 2016. The revelation that the original ending was much different probably explains a lot about how different the trailers were from the final product. Fans have noticed that many scenes in the original spots did not appear in the final film. ^ Kit, Borys (May 31, 2016). "Disney Orders Reshoots for Star Wars Stand-Alone Rogue One This Summer". The Hollywood Reporter. Retrieved April 9, 2019. ^ Beznican, Anthony (June 3, 2016). "Rogue One Reshoots: What's True and False About the Changes to the Star Wars Film". Entertainment Weekly. Retrieved April 9, 2019. ^ Kit, Borys (August 3, 2016). "Rogue One Drama: Writer Tony Gilroy Taking on More Duties". The Hollywood Reporter. Retrieved April 9, 2019. ^ Kit, Borys (November 30, 2016). "Rogue One Writer Tony Gilroy to Make Millions Off Reshoots". The Hollywood Reporter. Retrieved April 9, 2019. ^ Osborn, Alex (August 12, 2016). "Star Wars: Tony Gilroy Credited as Screenwriter on Rogue One". IGN. Retrieved April 9, 2019. ^ Jagernauth, Kevin (October 19, 2015). "Rumor: Christopher McQuarrie Did A Pass On Rogue One Script; Michael Arndt Credited On The Force Awakens". IndieWire. Retrieved April 9, 2019. ^ Perez, Rodrigo (August 29, 2018). "Chris Weitz Says Christopher McQuarrie, Scott Z. Burns & More Wrote On Rogue One: A Star Wars Story". The Playlist. Retrieved April 9, 2019. ^ Drysdale, Jennifer (July 15, 2016). "EXCLUSIVE: Kathleen Kennedy and Gareth Edwards Tease 'Rogue One' Opening Crawl -- See What They Said!". Entertainment Tonight. Retrieved July 17, 2016. ^ Lang, Brent (November 22, 2016). "'Star Wars': Lucasfilm Chief Previews 'Rogue One' and Han Solo Spinoff". Variety. Archived from the original on November 23, 2016. Retrieved November 23, 2016. ^ De Semlyen, Phil (August 23, 2016). "Exclusive: Rogue One's Gareth Edwards explains the movie's title". Empire. Archived from the original on August 23, 2016. Retrieved August 23, 2016. ^ Kit, Borys (January 20, 2015). "Tatiana Maslany, Rooney Mara Testing for 'Star Wars' Stand-alone Movie". The Hollywood Reporter. Retrieved January 22, 2015. ^ Kit, Borys (February 3, 2015). "'Star Wars' Stand-alone Movie to Star Felicity Jones (Exclusive)". The Hollywood Reporter. Retrieved February 4, 2015. ^ Fleming Jr, Mike (March 25, 2015). "Ben Mendelsohn Orbiting 'Star Wars' Spinoff 'Rogue One'?". Deadline Hollywood. Retrieved March 30, 2015. ^ Sneider, Jeff; Ge, Linda (April 23, 2015). "Sam Claflin Eyed to Star in 'Star Wars: Rogue One'; Riz Ahmed in Talks (Exclusive)". TheWrap. Retrieved June 16, 2015. ^ Kroll, Justin (May 13, 2015). "'Star Wars: Rogue One': Diego Luna Joins Felicity Jones in Lead Role (EXCLUSIVE)". Variety. Retrieved May 25, 2015. ^ Kroll, Justin (June 15, 2015). "'Star Wars: Rogue One': Forest Whitaker Joins Standalone Film (EXCLUSIVE)". Variety. Retrieved June 16, 2015. ^ Sciretta, Peter (July 27, 2015). "'Sherlock' Actor Jonathan Aris Joins 'Star Wars: Rogue One'". /Film. Retrieved July 28, 2015. ^ Rothman, Michael (June 22, 2016). "'Rogue One: A Star Wars Story': 'Darth Vader is Back'". ABC News. Retrieved June 22, 2016. ^ Yaqoob, Janine (August 8, 2015). "Star Wars - The Force Awakens but the Storm Troopers are just chilling". Daily Mirror. Retrieved August 11, 2015. ^ "Relaxing in a galaxy far, far away! Off-duty Stormtroopers are pictured on desert set during filming of spin-off movie Star Wars Anthology: Rogue One". Daily Mail. August 10, 2015. Retrieved August 11, 2015. ^ Ward, Jason (August 8, 2015). "First Photos of Stormtroopers on set from Star Wars: Anthology Rogue One". Making Star Wars. Retrieved August 11, 2015. ^ Miller, Neil (December 16, 2016). "The Amazing Camera Technology Behind The Look of Rogue One". Film School Rejects. Retrieved December 22, 2016. During our sit down with ... Gareth Edwards ... old lenses and new digital environments. ^ Fish, Andrew (February 2016). "Interview with Kathleen Kennedy". American Cinematographer. Archived from the original on June 16, 2016. Retrieved June 18, 2016. ^ "5 'Rogue One' Filming Locations You Can Visit On Vacation". Movie Pilot. December 12, 2016. Archived from the original on December 20, 2016. Retrieved December 17, 2016. ^ a b Sciretta, Peter (January 25, 2016). "'Star Wars: Rogue One': Everything We Know (So Far)". /Film. Retrieved December 21, 2016. ^ McCarthy, Niall (December 16, 2016). "A Look At The Real Star Wars Universe [Infographic]". Forbes. Retrieved December 22, 2016. ^ Carey, Meredith (December 16, 2016). "6 Star Wars 'Rogue One' Filming Locations You Can Visit Right Now". Condé Nast. Retrieved December 22, 2016. ^ Butler, Alex (December 15, 2016). "World In a galaxy far, far away – the real-life locations of Rogue One: A Star Wars Story that travellers can visit". Lonely Planet. Retrieved December 22, 2016. ^ Deluyas, Elyssa (December 19, 2016). "'Rogue One' News: Visit These Stunning Filming Locations To Have The Ultimate 'Star Wars' Journey". Travelers Today. Retrieved December 22, 2016. ^ "HaveeruOnline - Cast heads to Maldives for Star Wars shooting". Archived from the original on December 3, 2015. ^ Collin, Robbie (July 16, 2016). "Star Wars: Rogue One - Darth Vader is back and other things we learned from the behind the scenes video". The Daily Telegraph. Retrieved December 17, 2016. ^ a b Lewis, Rebecca (December 20, 2016). "11 things you may not have known about Rogue One: A Star Wars Story". Metro. Retrieved December 21, 2016. ^ Hall, Jacob (August 9, 2016). "Rogue One Bits: New Details on Jedha, a Mysterious New Planet Name, and a First Look at New LEGO Sets". /Film. Retrieved December 17, 2016. ^ Williams, Owen; Mcculloch-Keeble, Cameron (February 23, 2016). "Rogue One: A Star Wars Story - everything you need to know". Empire. Retrieved March 1, 2016. ^ Jolin, Dan (December 14, 2016). "Rogue One: A Star Wars Story – The complete history, Part III". Empire. Retrieved December 18, 2016. ^ Daniels, Nia (May 12, 2016). "Re-shoots for Rogue One: A Star Wars Story". The Knowledge. Retrieved December 21, 2016. ^ McEwan, Cameron K (October 25, 2016). "Here's what we know about the new Star Wars film". Metro. Retrieved December 22, 2016. Director Gareth Edwards told thousands of fans at Star Wars Celebration in London earlier this year he had always wanted to film a sci-fi movie there. ^ a b Collin, Robbie (July 16, 2016). "Star Wars: Rogue One - Darth Vader is back and other things we learned from the behind the scenes video". The Daily Telegraph. Archived from the original on July 16, 2016. Retrieved July 20, 2016. ^ MacDonald, Adrian (May 2017). "2016 Feature Film Study" (PDF). FilmL.A., Inc. Retrieved March 21, 2018. ^ Loughrey, Clarisse (February 11, 2016). "Star Wars: Rogue One virtually finished, Disney 'absolutely love' what they've seen". The Independent. Retrieved June 18, 2016. ^ Breznican, Anthony (June 3, 2016). "What's true and false about the reshoots for Rogue One: A Star Wars Story". Entertainment Weekly. Retrieved June 7, 2016. ^ Kit, Borys (August 3, 2016). "'Rogue One' Drama: Writer Tony Gilroy Taking on More Duties". The Hollywood Reporter. Retrieved October 24, 2018. ^ Couch, Aaron (August 5, 2018). "Tony Gilroy on 'Rogue One' Reshoots: They Were in "Terrible Trouble"". The Hollywood Reporter. Retrieved October 24, 2018. ^ Fullerton, Huw (December 18, 2016). "They are going through hours and hours of old footage from the horror movies to recreate his legs and feet ..." Retrieved December 18, 2016. ^ a b c Tapley, Kristopher; Debruge, Peter (December 16, 2016). "'Rogue One': What Peter Cushing's Digital Resurrection Means for the Industry". Variety. Retrieved December 18, 2016. ^ Hickel, Hal (September 11, 2018). "Answer - Why does Tarkin's CGI in Rogue One look so plastic-y? Could they have made it look more realistic?". Quora. Retrieved September 11, 2018. ^ Itzkoff, Dave (December 27, 2016). "How 'Rogue One' Brought Back Familiar Faces". The New York Times. Retrieved December 28, 2016. ^ Telegraph Film. "'Morbid and off-putting' or 'convincing'? Rogue One's CGI Peter Cushing gets a mixed response from Star Wars fans". The Telegraph. Retrieved December 18, 2016. ^ Fullerton, Huw (December 15, 2016). "How a Holby City actor brought one of Star Wars' most iconic characters back to life". Retrieved December 15, 2016. ^ Hooton, Christopher (December 19, 2016). "Rogue One's CGI Princess Leia: The sands of time are so cruel you can't even do motion capture for your younger self". Independent. London. Retrieved December 23, 2016. ^ Leadbeater, Alex (November 30, 2016). "Star Wars: Rogue One Finishes Post-Production". ScreenRant. Archived from the original on November 30, 2016. Retrieved November 30, 2016. ^ a b c Breznican, Anthony (November 23, 2016). "Rogue One composer Michael Giacchino describes music of the Star Wars standalone". Retrieved November 23, 2016. ^ "Star Wars Rogue One Composer Is Alexandre Desplat, Not John Williams". March 16, 2015. Retrieved August 12, 2016. ^ a b "Rogue One Bits: Mads Mikkelsen Sheds More Light on His Character, Alexandre Desplat Talks, Disneyland Releases First Merch - Page 2 of 3". /Film. May 2, 2016. Retrieved August 12, 2016. ^ Kit, Borys (September 15, 2016). "'Star Wars: Rogue One' Replaces Its Composer (Exclusive)". The Hollywood Reporter. Retrieved September 15, 2016. ^ "Walt Disney Records Releases Rogue One: A Star Wars Story Original Motion Picture Soundtrack Today" (Press release). PRNewsire. Burbank, California. December 16, 2016. Retrieved December 17, 2016. ^ @GoSoundtracks (December 16, 2016). "All right. I'm renaming my soundtrack titles" (Tweet) – via Twitter. ^ "Is ROGUE ONE The End Of Michael Giacchino's Punny Track Titles?". Birth. Movies. Death. Retrieved December 29, 2016. ^ Hughes, Mark (January 7, 2017). "How Disney And Dolby Brought 'Rogue One' To Historic Pantages". Forbes. Retrieved January 17, 2017. ^ Pressberg, Matt (January 10, 2017). "Here's Why 'Rogue One' Failed to Take Off in China". Forbes. Retrieved January 17, 2017. ^ McClintock, Pamela (March 22, 2015). "'Mission: Impossible 5' Gets a 'Rogue' Name, Trumps 'Star Wars' (Video)". The Hollywood Reporter. Archived from the original on March 4, 2016. Retrieved April 9, 2016. ^ "Rogue One: A Star Wars Story trailer: Felicity Jones makes a roguish, Han Solo-style heroine". The Telegraph. April 7, 2016. Retrieved April 7, 2016. ^ McMillan, Graeme (April 7, 2016). "'Rogue One' Teaser Brings Hope of a Subversive 'Star Wars' Prequel". The Hollywood Reporter. Retrieved April 7, 2016. ^ Sims, David (April 7, 2016). "The Star Wars Empire Rolls on With Rogue One". The Atlantic. Retrieved April 7, 2016. ^ Anthony D'Alessandro (April 8, 2016). "'Rogue One' Teaser Blasts Off With Close To 30M Online Views Since Thursday Debut". Deadline Hollywood. Retrieved April 8, 2016. ^ Kelley, Seth; Freer, Ian (July 15, 2016). "'Rogue One': 'Star Wars' Film Releases New Footage, Poster". Variety. Archived from the original on July 16, 2016. Retrieved July 20, 2016. ^ Woollaston, Victoria (August 12, 2016). "Darth Vader returns in the new trailer for Rogue One: A Star Wars Story". Wired. Archived from the original on August 12, 2016. Retrieved August 12, 2016. ^ Bramesco, Charles (August 12, 2016). "'Rogue One': 5 Things We Learned From New Trailer". Rolling Stone. Archived from the original on August 12, 2016. Retrieved August 12, 2016. ^ McMillan, Graeme (October 13, 2016). "'Rogue One': How the New Trailer Looks Like It's for a Different Movie Than Before". The Hollywood Reporter. Archived from the original on October 14, 2016. Retrieved October 17, 2016. ^ Busis, Hillary (October 13, 2016). "New Rogue One Trailer Taps into the Star Wars Franchise's Greatest Natural Resource". Vanity Fair. Archived from the original on October 17, 2016. Retrieved October 17, 2016. ^ "The Mystery Box is Dead: Lucasfilm Shows Fans 20 Minutes of Rogue One". Furious Fanboys. Retrieved December 2, 2016. ^ Barsanti, Sam (December 6, 2016). "Chinese Rogue One trailer has lots of new Donnie Yen footage". The A.V. Club. Retrieved June 13, 2017. ^ Lodderhose, Diana (December 8, 2016). "'Rogue One' China Trailer Lands With More Footage Of Chinese Stars". Deadline Hollywood. Retrieved July 9, 2017. ^ Makuch, Eddie (February 22, 2017). "Star Wars: Rogue One's Digital And Blu-ray/DVD Release Dates Announced, Bonus Features Revealed". GameSpot. Retrieved February 23, 2017. ^ Eddy, Cheryl (December 5, 2016). "George Lucas Likes Rogue One More Than Force Awakens, and Other Fun Facts We Learned This Weekend". io9. Retrieved October 16, 2018. ^ Nancy Tartaglione (January 22, 2017). "'Rogue One' Blasts Past $1B At Global Box Office; 'Moana' Sails To $500M+". Deadline Hollywood. Retrieved January 22, 2017. ^ "2016 Domestic Grosses". Box Office Mojo. Retrieved January 23, 2017. ^ "'Rogue One' maintains stellar course at box office". Samaa Web Desk. Samaa TV. ^ Fleming Jr, Mike (April 3, 2017). "No. 3 'Rogue One' Box Office Profits – 2016 Most Valuable Movie Blockbuster Tournament". Deadline Hollywood. Retrieved April 3, 2017. ^ D'Alessandro, Anthony (November 22, 2016). "'Rogue One' Hits Tracking With $100M-$140M; UK Tickets Available, So When Do U.S. Sales Begin?". Deadline Hollywood. Retrieved November 23, 2016. ^ McClintock, Pamela (November 22, 2016). "'Rogue One: A Star Wars Story' Tracking for Huge $130M-Plus U.S. Debut". The Hollywood Reporter. Retrieved November 23, 2016. ^ Lang, Brent (November 22, 2016). "'Star Wars: Rogue One' Not Expected to Do 'Force Awakens' Business, Disney CEO Says". Variety. Retrieved November 23, 2016. ^ Grauso, Alisha (November 28, 2016). "Pre-Sales For 'Rogue One' Crash Fandango's Site -- And Disney Benefits From It". Forbes. ^ Lang, Brent (November 29, 2016). "'Rogue One: A Star Wars Story' Has Second-Highest First Day of Ticketing Pre-Sales". Variety. ^ a b c D'Alessandro, Anthony (December 18, 2016). "'Rogue One' Blasting Off To Est. $30M Thursday Night – B.O. Update". Deadline Hollywood. Retrieved December 19, 2016. ^ D'Alessandro, Anthony (December 27, 2016). "'Rogue One' & 'Sing' Christmas Juggernaut Leaves Room For Specialty Films – Final Weekend Update". Deadline Hollywood. Retrieved December 30, 2016. ^ Brad Brevet (December 11, 2016). "'Moana' Threepeats at #1, 'La La Land' Opens Big in Limited Release". Box Office Mojo. Retrieved December 12, 2016. ^ "'Rogue One' Doesn't Want To Fall To 'Hidden Figures' As Winter Storm Helena Closes Theaters". Deadline Hollywood. ^ "Rogue One: A Star Wars Story (2016)". Rotten Tomatoes. Fandango. Retrieved February 1, 2019. ^ "Rogue One: A Star Wars Story Reviews". Metacritic. CBS Interactive. Retrieved December 16, 2016. ^ Goldman, Eric (December 13, 2016). "Rogue One: A Star Wars Story Review". IGN. Retrieved December 14, 2016. ^ Travers, Peter (December 13, 2016). "Peter Travers: 'Rogue One: A Star Wars Story' Movie Review". Rolling Stone. Retrieved December 14, 2016. ^ Sciretta, Peter (December 13, 2016). "Rogue One Spoiler Free Review: Finally A Good Star Wars Prequel". /Film. Retrieved December 13, 2016. ^ Barsanti, Chris (December 13, 2016). "Rogue One: A Star Wars Story' Shows There's Life in Star Wars Yet ... Barely". PopMatters. ^ Chang, Justin (December 13, 2016). "'Rogue One' adds an uneven but thrilling wrinkle to the mythology of 'Star Wars'". Los Angeles Times. ^ Scott, A. O. (December 13, 2016). "Review: 'Rogue One' Leaves 'Star Wars' Fans Wanting More and Less". The New York Times. ^ Brody, Richard (December 13, 2016). ""Rogue One" Reviewed: Is it Time to Abandon the "Star Wars" Franchise?". The New Yorker. Retrieved December 13, 2016. ^ Hornaday, Ann (December 13, 2016). "'Rogue One' doesn't offer much joy, but Star Wars fans will enjoy it anyway". The Washington Post. ^ Ehrlich, David. "'Rogue One' Review: The First 'Star Wars' Spinoff Is a Scrappy Space Adventure That Plays Things Painfully Safe". IndieWire. Retrieved December 14, 2016. ^ Bradshaw, Peter. "Rogue One: A Star Wars Story review – a sleek addition to the fleet". The Guardian. Retrieved December 23, 2016. ^ Star Wars (May 20, 2017). "Star Wars: Who is your favorite Rogue One Character". StarWars.com. Retrieved July 9, 2017. ^ Hawkes, Rebecca (December 20, 2016). "From Rogue One's Peter Cushing to Audrey Hepburn: 6 stars who were digitally brought back to life". The Daily Telegraph. London. Retrieved December 23, 2016. ^ Shoard, Catherine (December 21, 2016). "Peter Cushing is dead. Rogue One's resurrection is a digital indignity". The Guardian. London. Retrieved December 24, 2016. ^ Walsh, Joseph (December 16, 2016). "Rogue One: the CGI resurrection of Peter Cushing is thrilling – but is it right?". The Guardian. London. Retrieved December 23, 2016. ^ Althoff, Eric (December 20, 2016). "The Force reawakens deceased cast—probably for years to come". The Washington Times. Washington, DC. Retrieved December 23, 2016. ^ Dockterman, Eliana (December 19, 2016). "Let's Talk About Grand Moff Tarkin in Rogue One". Time. Retrieved December 23, 2016. ... the effect ends up showing the limitations of the technology. It's also distracting: As you ponder what, exactly, is off about this not-human-enough figure—something in the facial movements—you begin to lose track of the plot. ^ Lawler, Kelly (December 19, 2016). "How the 'Rogue One' ending went wrong". USA Today. Retrieved December 23, 2016. ^ Cavna, Michael (December 15, 2016). "One of the best performances in 'Rogue One' is by an actor who died in 1994". The Washington Post. Washington, DC. Retrieved December 24, 2016. ^ "Excellence in Fantasy Film". Costume Designer's Guild. Retrieved February 26, 2017. ^ Nugent, John (March 19, 2017). "Three Empire Awards 2017: Rogue One, Tom Hiddleston And Patrick Stewart Win Big". Empire. Retrieved March 19, 2017. ^ Liptak, Andrew (August 11, 2017). "Women swept nearly every category at the 2017 Hugo Awards". The Verge. Retrieved August 25, 2017. ^ Petski, Denise. "Hidden Figures,' 'La La Land' Among Location Managers Guild Award Nominees". The Hollywood Reporter. Retrieved February 22, 2017. ^ "Get Out Leads the Nominations for MTV's First Ever Movie & TV Awards". People. April 6, 2017. Retrieved April 8, 2017. ^ "2016 - The Nebula Awards". The Nebula Awards. Retrieved May 18, 2017. ^ "Saturn Awards winners". Saturn Awards official website. Retrieved June 29, 2017. ^ Rubin, Rebecca. "Teen Choice Awards 2017: 'Riverdale,' Fifth Harmony Shut Out Competition". Variety. Retrieved August 14, 2017. ^ "The Star Wars Rebels Easter Eggs and Connections in Rogue One - StarWars.com". December 20, 2016. ^ Ratcliffe, Amy. "Rogue One Character Joins Star Wars Rebels, and More TV News". Nerdist. Retrieved September 15, 2017. ^ Davis, Ryan. "The Unexpected Ways 'Star Wars Rebels' Season 4 Connects to 'Rogue One'". CheatSheet. Retrieved September 15, 2017. ^ Chmielewski, Hipes, Dawn C., Parick (November 8, 2018). "'Rogue One' Prequel Series In Works For Disney's Streaming Service, Now Named Disney+". Deadline. Retrieved November 9, 2018. ^ Collinson, Gary (September 2, 2016). "Synopsis for Star Wars Catalyst novel offers background details on Rogue One". Flickering Myth. Archived from the original on September 12, 2016. Retrieved September 12, 2016. ^ "Rogue One Prequel Book Reveals Secret Origins of the Death Star". MovieWeb. September 1, 2016. Retrieved September 21, 2016. ^ Rogue One: A Star Wars Story by Alexander Freed | PenguinRandomHouse.com. ^ Ratcliffe, Amy. "Star Wars Novel Rebel Rising To Explore Jyn Erso's Backstory". Nerdist. Retrieved November 16, 2017. ^ Bui, Hoai-Tran. "New 'Rogue One' Scenes in the Comic Adaptation Flesh Out The Movie's Story". /Film. Retrieved September 15, 2017. ^ "EXCLUSIVE: Star Wars: Rogue One Graphic Novel Adaptation (Preview)". CBR. Retrieved December 11, 2017. ^ "New Rogue One Graphic Novel Adaptation Coming from IDW". Star Wars. Retrieved December 11, 2017. ^ "Star Wars Battlefront: Rogue One: Scarif". Starwars.ea.com. ^ "Star Wars Battlefront Rogue One: X-wing VR Mission". EA Star Wars Games. Retrieved March 12, 2017. ^ "Rogue One: A Star Wars Story Content Comes to Star Wars: Commander". starwars.com (Press release). Lucasfilm. September 30, 2016. Retrieved September 14, 2018. ^ Westenberg, Jimmy. "Star Wars: Galaxy of Heroes goes rogue with new characters from Rogue One". AndroidAuthority. Retrieved September 15, 2017. Wikimedia Commons has media related to Rogue One.